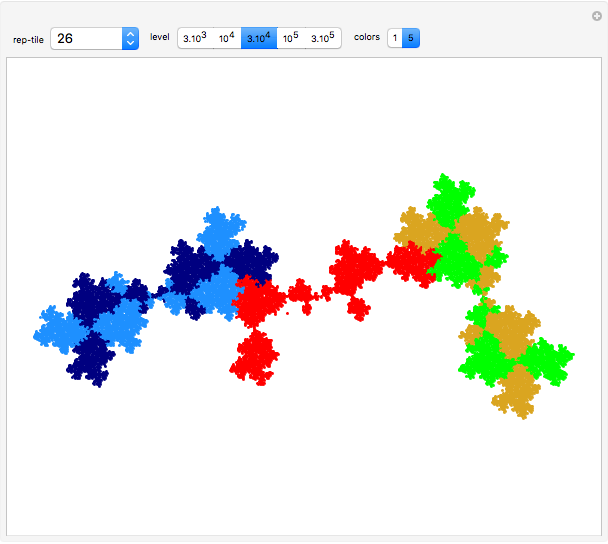 Rep-tiles and fractals of order five are defined as iterated function systems (IFS) and evaluated via the "chaos game" method. 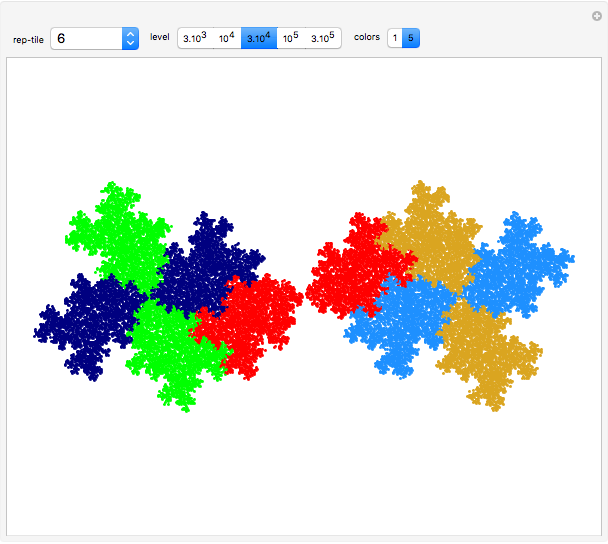 This Demonstration deals with the uncommon fractal rep-tiles of order five. Rep-tiles are plane figures that can be dissected into congruent smaller figures, possibly by a reflection. 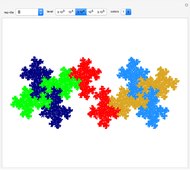 Fractal rep-tiles are also called frac-tiles. All shapes shown in this Demonstration can be combined into unit tiles that tile the plane periodically. The rep-tiles are defined as iterated function systems (IFS) and are evaluated via the "chaos game" method. The rep-tile examples 1–4 follow the teardrop concept of Gosper . Examples 5–8 and 23–38 are derived from these teardrops. A collection of space-filling curves that can be converted into tilings is given in . All tilings in this Demonstration are based on a rotation angle that also appears in the well-known pinwheel tiling . Hence, some of these show infinite orientations of subtiles, in which tiles are iteratively substituted by five smaller copies. Only a few of the large variety of possible tile shapes are shown in examples 31–38. The miscellaneous examples 39–43 include the pinwheel tile and some irreptiles. Every rep-tile of order three can be converted into irreptiles of order five (see examples 41 and 42). This collection is not complete. More rep-tiles and irreptiles of order five exist; see the Related Links. Be patient when using the highest iteration level. In order to calculate image points, a lot of processing resources are required. R. W. Gosper. "Teardrop Frac-n-tiles." (Dec 19, 2016) www.tweedledum.com/rwg/frac5.htm. J. Ventrella, "The Root 5 Family, a Chapter from Brainfilling Curves." (Dec 19, 2016) www.fractalcurves.com/Root5.html. Wikipedia. "Pinwheel Tiling." (Dec 19, 2016) en.wikipedia.org/wiki/Pinwheel_tiling. Dieter Steemann "Rep-tiles and Fractals of Order Five"